She's a nerd. With glasses. In a wheelchair. He is an escape room creator, among other things, including having a live stream where she was his only follower. Who are they? Regina Hobbs and Gustave Nguyen. They met online years ago, and will soon meet in person. Reggie is a successful businesswoman and she runs Girls with Glasses. Currently she is over-stressed and is coping with insomnia. Reggie has been attending Gus's live streams and realizes that only his voice can relax her enough into sleep. Gus has a challenge. His job in creating an escape room is supposed to center around a romance anime. The fact that Reggie is an anime expert is valuable to him. When she makes an unusual request, he realizes they can make a very nice trade and this just might allow him to be successful in his endeavor. What a cute little story. 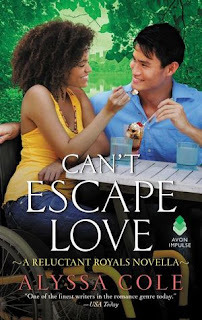 Can't Escape Love is a great addition to the Reluctant Royals series. We even see snippets of Reggie's conversations with her twin Portia, from Book 2 in the series, A Duke by Default. This is a sweet story that includes the fun of game play and puzzles and a sizzling romance. Delightfully, as the cover shows, it is another interracial romance. Although it could do well as a standalone, why not gobble up the entire series? Many thanks to Avon Impulse and Edelweiss for this ARC to review in exchange for my honest opinion. She is represnted by Lucienne Diver at The Knight Agency. 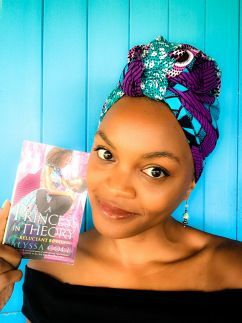 To learn about new releases, sign up for Alyssa’s newsletter here. If you would like to contact Alyssa, feel free to email using the form below!